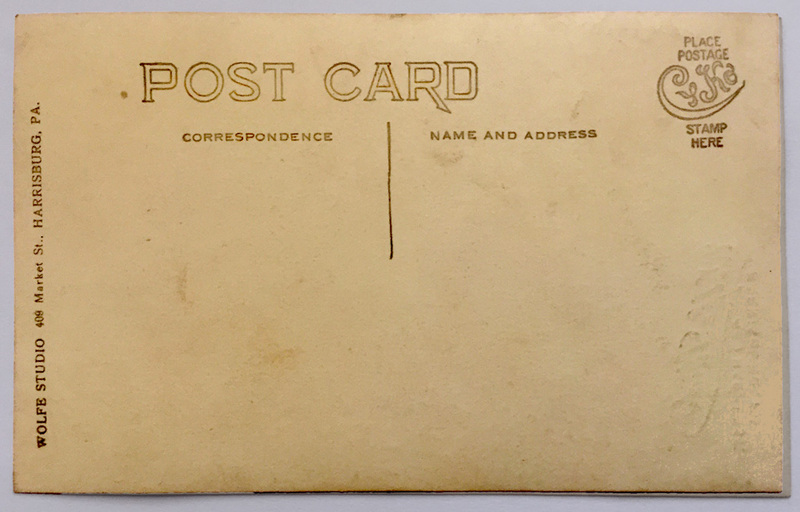 Many other postcards have been posted on this website since my sisters and I have been sorting through the house Aunt Ruthie shared with my Grandma Fannie. You can visit them here and here. 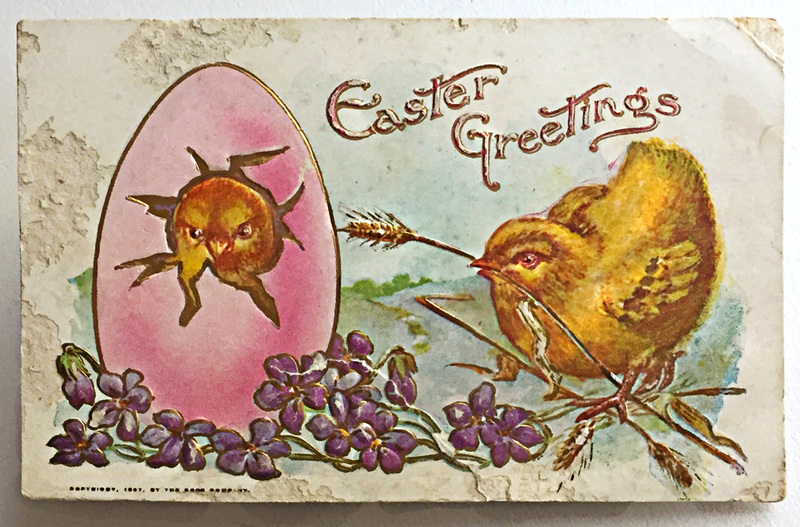 This season I share the joy of Easter via vintage postcards from the archives of Fannie Martin Longenecker, my grandmother. 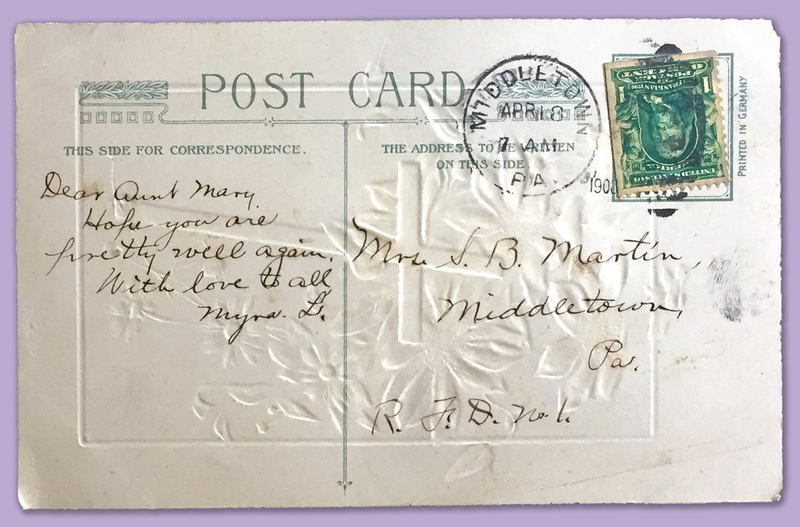 Cousin Myra Laverty sent an Easter greeting announcing pleasure in her new home and perhaps suggesting she’d like her cousin Fannie Martin (Longenecker) to write more often. Notice the postcard is made in Germany. How Grandma Longenecker looked when these postcards were exchanged. 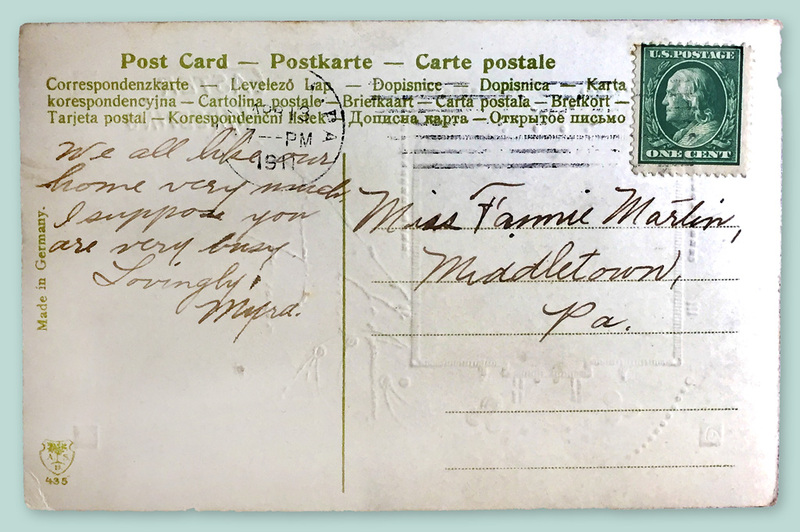 Fannie Martin went to considerable expense to have Wolfe Studio in Harrisburg, PA adapt the formal photograph as a postcard. Mennonites joined the church after they married They often did not become plain until after their first child was born. Thus, in this photo Fannie was fancy. Her dress and manner suggest an age when courtesy counted, kindness was a virtue and rudeness was not rewarded. The documentation below proves that the culture of her day expected public civility. In 2009, tired of vicious attacks he observed among politicians and in the media, Republican Mark DeMoss launched an initiative he named The Civility Project with a pledge to be “respectful of others whether or not I agree with them.” Senator Joseph Lieberman and few others joined him, but unfortunately, the movement didn’t gain much traction. My friend, author/researcher Janet Givens has published a series of posts on civility in public discourse. You can begin here. Other enlightening posts on this theme follow. Have you been the giver or receiver of a kind gesture recently? 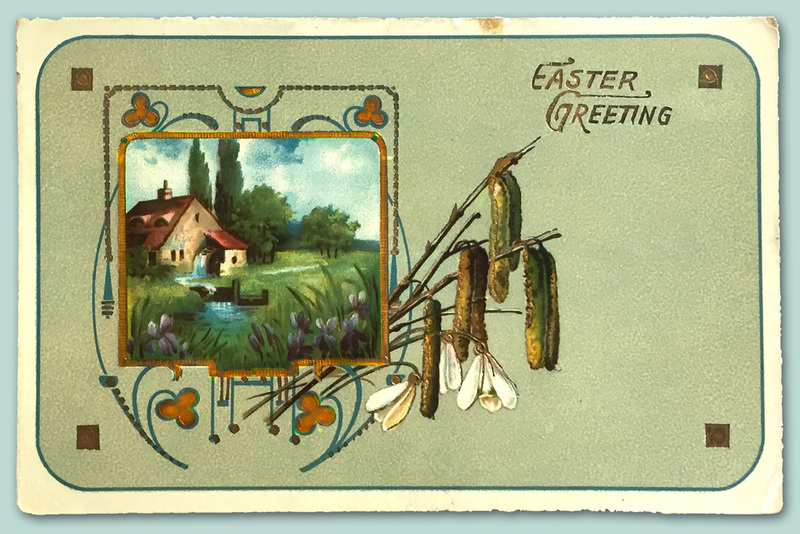 Do you send Easter (or Passover) cards? Do you celebrate the season in any other special way? After Grandma was fancy, she became plain, the way I knew her all my life. I’m struck by a similarity I found from your post today, Marian, between Mennonites and the Muslims I knew in Kazakhstan. It has to do with choice, and waiting until a later time to fully adopt the practices of the faith. Plain or Fancy, with Mennonites; headscarf or no with my young Muslim colleagues. I never knew one had any choice in the matter. Fascinating. I’m happy to link. I read your post again and noted many parallels. 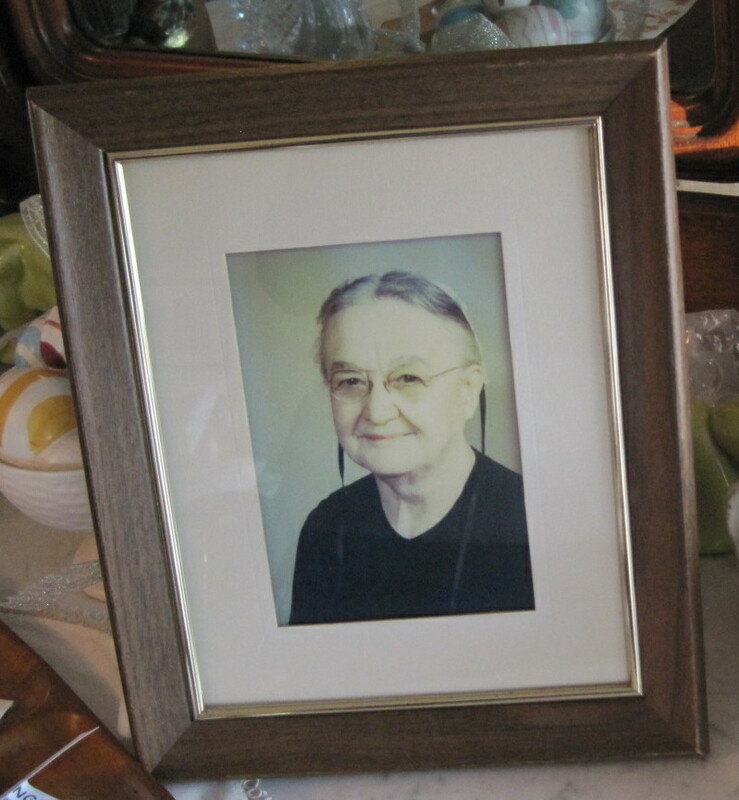 Just recently I learned more about the Serbian refugee family that lived for a while in Grandma and Ruthie’s house. At appointed times, the Muslim father would lift the window facing east in Grandma’s bedroom toward Mecca. I am certain this family was welcome at Bossler Mennonite Church. I look forward to your blogs … an oasis of courtesy and common sense in a world that seems to be losing its moral compass. Thank you, Marian. You are welcome, Lynn. Recently, I have attempted to write a mission statement for this blog. I’m still struggling with the wording but I am certain it will include promoting kindness. Marian, I love how you get right down to the basics of common courtesy through your family stories and precious relics while also informing us of pertinent events relevant to our times. So many examples of lack of civility in our world make it even more important to practice civility in our own lives. Thank you for enlightening and reminding us of the things that matter! I think serendipity is at work sometimes when I write. When I found the postcards, I knew I could use them in a future blog post. Because of a flight delay a few weeks ago, I found the O magazine article at a kiosk and went from there. You are always so encouraging. Thank you, Kathy! Lovely Marian thank you. The postcards are a delight. Kindness and civility are so necessary at all times, irrespective of when, where or how. Have I been the receiver or giver of a kind gesture recently? I’m really trying to think … I encouraged a friend in her paintings over the phone the other day, after she sent me a photograph of a recent painting – she really seemed to appreciate it. And no, re sending Pesach or Easter cards. Though this is a time for much reflection, hopefully renewal as well. A Blessed Easter to you and family. (I’ve just eaten the chocolate egg I bought for my husband). I’m still chuckling about eating the chocolate egg you bought for your husband. My guess is that you are at home more than your husband is and thus find it easier to succumb to temptation. Here’s to chocolate eggs! You constantly spread kindness, civility, and knowledge with your blog and now I find verbally as well. 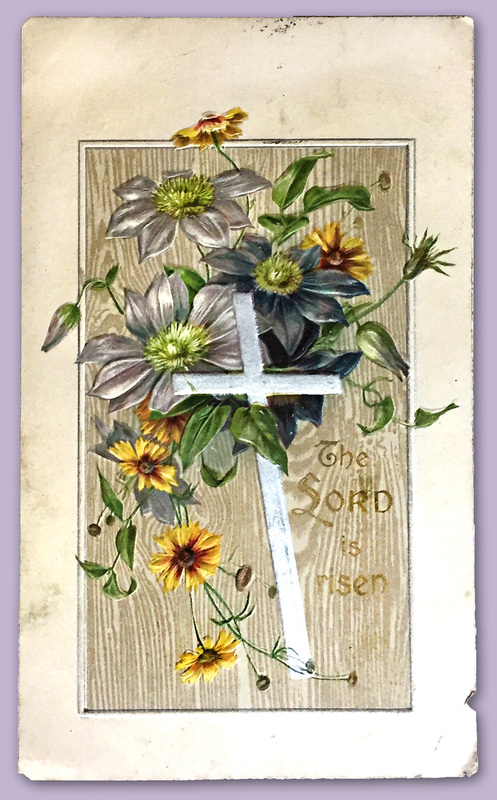 A blessed Easter to you and your family too, Susan. Thank you – It works both ways, Susan. It’s reassuring to think positive energy is being beamed across continents and hemisphere here. Loved the picture of your grandma in her younger years! Didn’t know they were allowed to be fancy until marriage. Kindness is certainly not emphasised as much as it should be these days. I usually enjoyed my teaching in the German dept. at university, but one semester I had what I called a “class from Hell.” My supervisor told me that the secret was to be very strict snd mean at the beginning and then the problem would be solved. I did that with my next class, but neither the students or I enjoye that, and I went back to being my kind self. I never had another class like that one! My grandmother grew up in a United Brethren home, not Mennonite. Even so, her mother is pictured with a cap, indicating that it wasn’t just Amish or Mennonites that wore prayer veilings in those days. You can’t hide kindness, Elfrieda, and I’m sure your students sensed that. We can only hope these hellions grew up to be sensible and civil. Thank you for the Easter greetings, and for helping me reminisce about my teaching days with your comment. Each and every morning I’m the recipient of freshly brewed hot coffee that Len gets out of bed early to make. Note: not only does he make the coffee, but while it’s brewing, he pours boiling water into our ceramic mugs. When the coffee’s ready, he dumps the water and pours the coffee into pre-heated cups. Yes, he’s a keeper! Len knows how to treat a woman of substance. Of course, he is a keeper! I’m glad you enjoy these posts and leave comments that inspire others. You and Fatima are very blessed. My husband always makes the bed and changes sheets weekly, gestures I have come to expect but never take for granted. He occasionally fixes breakfast too. But he does serve me coffee as I’m the first one up in the morning. Thanks, both of you, for spreading cheer here. I am the most impressed with the studio shot turned into a postcard. Lovely! Now that’s a keepsake I likely would not get rid of. It reminds me of a studio shot of my Grandma Stauffer who also made a definite switch from fancy to plain as she came of age. Of the etiquette quotes above, this one spoke to me: “Never boast of your birth, your money, your grand friends, or anything that is yours. If you have traveled, do not introduce that information into your conversation at every opportunity.” So old fashioned, but so appreciated when practiced! Some considered professional photography a luxury in those days because of the expense. Aren’t we glad the Stauffers and the Martins saw the value in creating keepsakes. The etiquette quote you pointed out reminds me of conversations I’ve heard when speakers voice one-uppers about their travels or accomplishments. You can probably recall a few of these yourself – ha! I love the topic of civility and kindness. I was reminded of my experiences in college at a small state school in Pennsylvania in the early 70s. I actually had a course in “Social Usage” where we studied Emily Post and others. I also learned how to write formal invitations and pen the proper format for letters. It is amazing how the social etiquette changed during that time. My freshman year we had to “dress for dinner!’ No slacks were allowed! Then fast forward to my senior year when “open dorms” came into existence with men and women living in the same dormitory. Wow…that happened fast! The pendulum has certainly swung far and fast toward social permissiveness. It sounds as though you were contrasting your freshman and senior years at the same college. Wow! I spent my college years at Eastern Mennonite with a strict dress code and standard of conduct. Graduate school at Temple University was an eye-opener even though I was a day student only. Happy Spring to you too, Ann! I love seeing both fancy and plain sides of your Grandma. Thank you for sharing the wonderful cards and the equally wonderful visions of careful conversation. Blessed Holy Week Wednesday, and Happy Easter to you and your family, Marian. Dolores, I have appreciated your Lenten spiritual practice of memorizing and meditating upon Isaiah 55. The visuals you have created concurrently also inspire me. A blessed Easter to you and your also. Thanks, Marian, for reminding all of us about kindness and civility. Sometimes it seems as though they have been totally left behind especially when the day’s headlines bring us stories like the one about United Airlines. Joan, I couldn’t agree more. As our culture worsens and coarsens, I notice more and more that sensible people are proclaiming civility. Someone in power now needs to launch another Civility Project. I notice that you mingle with the courteous and kind here and on Facebook. That’s a tribute to your wisdom and good taste. May our tribe increase, Fatima. I remember when we sent Easter cards. Too bad that tradition is long gone. I love the photograph of your grandmother as a young unmarried woman. There can never be too much kindness in the world. I have met some writers locally and they have been very kind to me. Today they gave me excellent feedback on my writing. Another writer wrote an article about me and my books that was published in a local paper. I encounter kindness every day and I do hope I return it. Thank you for all the kindness you have extended to me. Have a wonderful Easter. I suspect you encounter kindness because you practice the Golden Rule. To date, I have done beta reads for two authors and received a careful read in return. With the time and energy involved, doing critical reads of others’ work is a monumental gift. So is voluntarily writing reviews. Darlene, I enjoy commenting on your blog regularly and sometimes link your website to my blog here, but I do so voluntarily because I like to spread the good. Happy Easter to you and our family. I absolutely adore these post cards, Marian. Being the card lover that I am, yes, I send Easter cards to friends and family. As for kindness from others, I have to say, the writing community is exploding with kind people. I’m blessed to be a part of it. Brava to you, Jill. I used to send out about a dozen Easter cards to friends and family. Now mailing for this season is more limited. This year I sent one to Aunt Ruthie, and to each of our children with passion play tickets. Thank you for introducing me to the lovely women at Seekerville. They are ambitious, talented, and gracious from what I can see so far. As a fashion maven, I knew you would probably perk up seeing those fancy hats, especially Grandma’s. Thanks for brightening my day by chatting here, Debby. So glad you liked the photos , you will be the first to see that room when we’ve finished …I have no idea when . Love this post , what amazing morals the Mennonites have . I belive we should respect all religions , don’t you Marian ? How much fun it would be if we did . Nothing has happened out of the ordinary to me lately but I do love random acts of kindness don’t you ? When something happens I ll let you know . Have a joyous Easter my sweet friend . The unique thing about your loft is the variety: stone, wood, and the vaulted ceiling. Wow! Yes, Cherry, I believe we should respect all religions: Christians who follow Jesus should practice what He preached. That’s true for all creeds! You always spread kindness and cheer when you appear here. Thanks, dear friend! I’m a late responder this week, Marian! I don’t think I ever received an email notification. I love all your postcards (as I’ve said before). Thank you for explaining your grandmother’s “fancy” dress. I wondered when I saw the photo. There does seem to be an erosion of civility. A friend of mine, a dietician, just told me that a client called her, berated her on the phone, told her that her advice was wrong and useless, and then hung up on her! You know our family gets together for Passover, even though we’re not religious. Our “Seder” is going to be on Saturday night. I’m in the midst of cooking, and one daughter has our play ready to go! Yes, you always respond, usually first in line. Your reply is welcome whenever it shows up here. Shame on that client. Some people are just mean, which is beyond our control. We can’t control them, but can keep our distance, I suppose. Have an enjoyable Seder celebration, surrounded by your loving family, Merril. I look forward to hearing about it Monday. We could certainly do with more of those values today. The world seems to have become all about boasting, being rude and scoring points regardless of who is hurt. I hear this from readers in all over Europe and in South Africa too. Because of media coverage worldwide a lot of negative stuff can circulate very quickly. Fortunately, so can the good! I hope you have healed from your mishap and can walk easily again soon. Best wishes during this season, Marie. What a lovely read on Easter Sunday afternoon. I love vintage postcards and advertising pieces. And has it occurred to you how many women in our grandmothers’ generation were called “Fannie?” This was like a cold drink of water drawn from a fresh water spring. Thank you, Marian, for being you. Your grandma was very elegant! I agree, and I’ll say thank you on her behalf. Even if she were alive, she would beg to differ. Thank you, Fiona. I like the two pictures of your grandmother “then and now”. We send Easter cards. We’ll wear our best spring dress for service. We go to the breakfast at church and then the rest of the day is spent with relatives and friends. As this is a university town and the students only have the weekend off many don’t travel home so our church always has an invitation out for students to come spend the day with us (church members). We went over to my husband’s family this year but my son and his family had 3 students join them. They have civility project here, also in town where my other son lives. I don’t know why they say it doesn’t exist anymore. I appreciate your approach to family traditions. Your description of the day sounds much like ours. This year for a change we were invited to my nephew’s house with extended family, probably more than twenty. Apparently, the Huffington Post can’t be trusted for accurate information unless it is referring only to the project begun by Mark DeMoss. I’d like to know more about how it operates in your town. Thanks for the updated information here! What a lovely post. I always enjoy seeing vintage holiday cards and the photograph of your grandmother and friends is beautiful, such great condition, too, as though it were shot only yesterday. Fun to compare the later picture and try to figure out which one in the first is your Grandmother. Kindness is so important in today’s world and it’s wonderful to see more and more people appreciating and passing along good deeds. Welcome, Marcia. It’s good to see you here. I seem to remember you as a guest on Darlene Foster’s blog recently. I hope I’m right; otherwise, you’ll have to revise my story – ha! It strikes me that your books would be a good fit for my granddaughter, Jenna, now almost twelve. About the postcards: They are in such great condition because they were stored away in a drawer in Grandma’s secretary for ages. 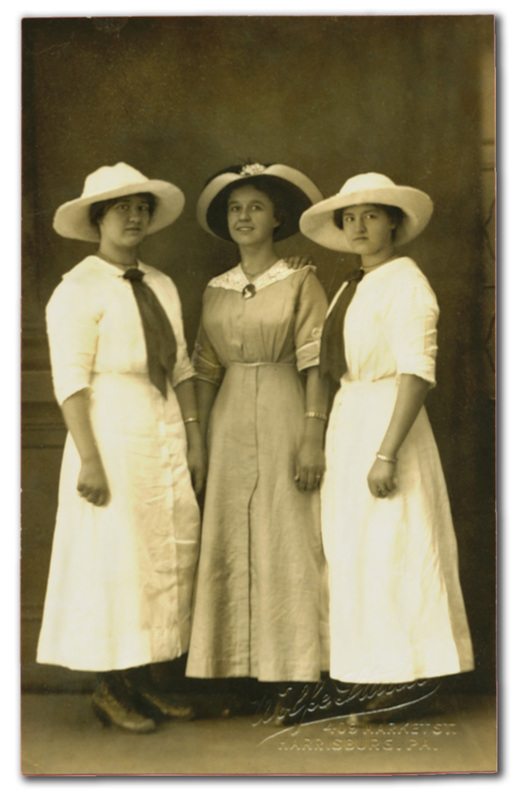 In the first photo, my grandma is in the middle with the grandest hat. Thanks for asking about kindness, Marian. I’ve received many recently. It was lovely to have my son and Jenna here for Easter. (We made pasta with tomato sauce and tofu balls, Vic’s favorite.) The day before Easter, the flower gardens were weeded and the day after Easter they were mulched. Projects are unfolding and, perhaps the biggest gift of all, a neighbor had a beautiful cabin to rent, so they’re moving there on May 1 while we make decisions and plans without pressure. Wonderful postcards, photos, and quotes–as always. Your grandma dressed just like my grandma, Zeola Edna Munderbach. The quotes remind me of a children’s book I inherited from my dad and still have called ‘Manly Manners.’ It could have been Womanly Manners just as well. It impressed me as a child since I lived in a physically disorderly home. There was lots of good advice about politeness and kindness, but the advice I always remember and acted on was to clean up dishes and put things away before going to bed for a fresh (and pleasant) beginning to the next day. My mother didn’t follow that advice, but I do, especially in the kitchen. Elaine, you capture so much of your life long past and now unfolding in these two paragraphs. Your mention the manners books, which reminded me of “Goofus and Gallant” in Highlights for Children. Remember them? Mother used to say, “If your dishes are washed and beds made, your house will look pretty good.” Mom was a neatnik, but her sister was not, much like the mother you describe. Lately I have begun to value order even more since we are working in a very disorderly house. Aunt Ruthie had many interests, bless her heart, and left evidence from attic to cellar.